The night bus from Flores to Guatemala City features regularly with tourists’ blogs but they’re not so much written for families. In fact we were the ONLY family on the bus that night so I thought I’d write a blog about it. 1 A few lies were told…. 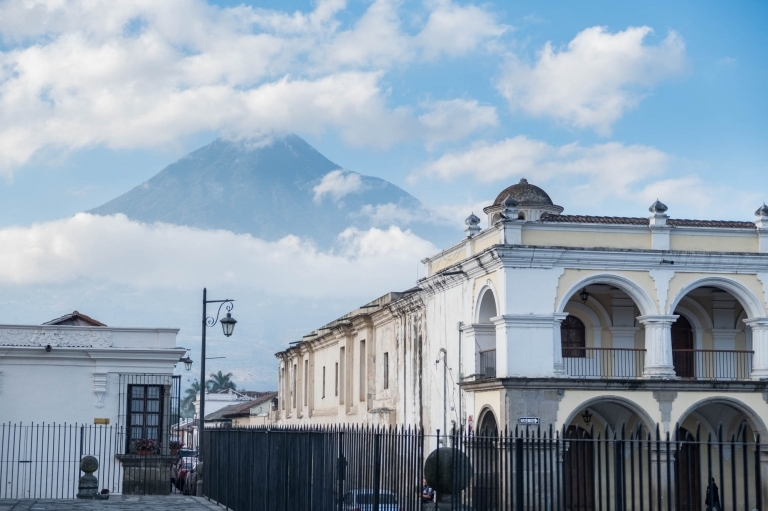 3 What to do in Guatemala City? 4 What to do in Antigua or Lake Atitlan? A few lies were told…. 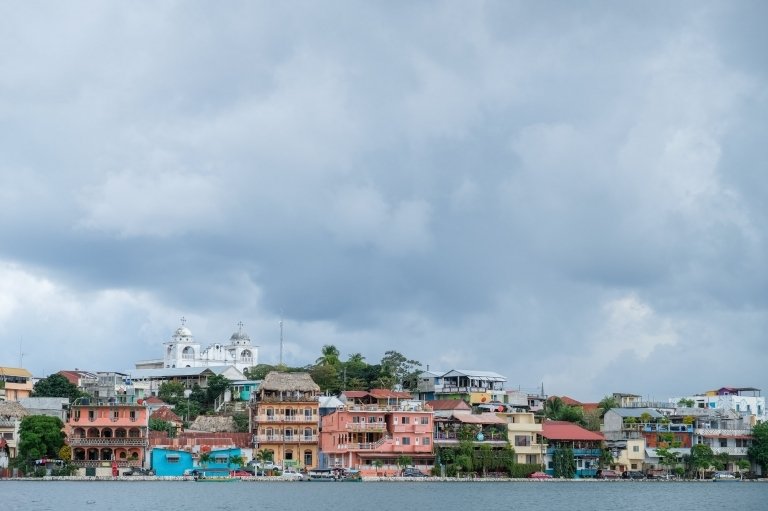 We caught the bus from Belize City to Flores so I wasn’t overly apprehensive about taking the kids on an overnight bus from Flores to Guatemala City but I was cautious. I had read that Zone 1 in Guatemala City was the worst area for violent. As I was travelling alone with the kids, I wanted to be as prepared as possible however it seems that I was met with nothing but lies from the bus company. So we’ve compiled a ‘how to survive’ list so you can be more comfortable and know what to expect from catching the night bus. How to survive the night bus with kids! Meet at the Flores sign – The bus arrives at the Flores sign just off the causeway onto Flores. It is a double decker coach with a toilet on each floor (although I would avoid using this) and from the outside it looks quite modern. The bus is always late – I am informed that the bus is always late and I was quite surprised to see that it was already quite full when it arrived. We were told to be there for 8pm although the bus didn’t arrive until 9pm. Book your tickets in good time and you’ll get better seats. We booked first class and were givenallocated seats. We sat upstairs with two kids at the very front of the bus and me and one child in the row behind. You’re given a bottle of water on board but you’ll need to take food, if you need it. I would recommend taking something for the morning as it’s a very early start. Wrap up warm, the bus is freezing! The air con is on full blast throughout the bus and if you’re unlucky enough to sit below a vent, you might freeze! I would definitely recommend wearing trousers, socks, hooded tops or a jumper to keep warm. If you have a blanket, keep it to hand. Take an eye mask or a hat to cover your eyes as there are frequent stops and the main lights flash on and off until at least midnight with every stop. Consider taking earplugs and/or headphones to block out the sounds of snoring…. Expect only 10cm of space as all of the seats recline. You are basically pinned against your seat with the forward seat’s headrest 10cm from your chest. It is not the most comfortable. A pillow or head comforter isn’t essential but it might be nice. Do not expect any quality of sleep because the bus is thrown around corners at break neck speeds and I was constantly being flung around the confines of my seat. It was slightly more scary for the kids in the seat in front of me as the glass windshield was cracked and kept hitting bits of tree as we violently passed. The toilets are absolutely disgusting (think overflowing toilet and urine slopping around the floor) and I would suggest that you avoid them if possible. Take toilet paper, wet wipes, soap etc as there is nothing provided. We were told that the bus was only for tourists but this is not correct. It was crammed full with tourists and locals alike. There were no spare seats. Most locals do not speak English, so a level of Spanish is recommended. You will have a 5am start arriving into Guatemala City. You will arrive into ZONE 18. Despite the bus company telling me repeatedly that we would arrive into Zone 1, we did not. Everybody was turfed off the bus in an abrupt manner. You will need to change bus here if you want to go to Zone 1. This will cost you an extra Q10 each. The bus you transfer to is a public city bus and we were the only foreigners on it. It takes an eternity to cross the city due to the terrible traffic. Keep your backpacks firmly on your knee and in plain sight at all times. If you choose to go to zone 1, you will arrive at 8am. There is an internal waiting room and the toilet is outside. You’ll need to pay to go and you’re given paper. I think the fee was Q2. What to do in Guatemala City? We didn’t spend very much time in Guatemala City as we were only there to meet Rich who was flying in from Texas before we head down to Antigua and Lake Atitlan. However the kids and I managed a trip to the Children’s Museum which was anything but a museum. If you have kids younger than about ten, I’d definitely recommend you pop in. Below animation from the Children’s Museum. What to do in Antigua or Lake Atitlan? 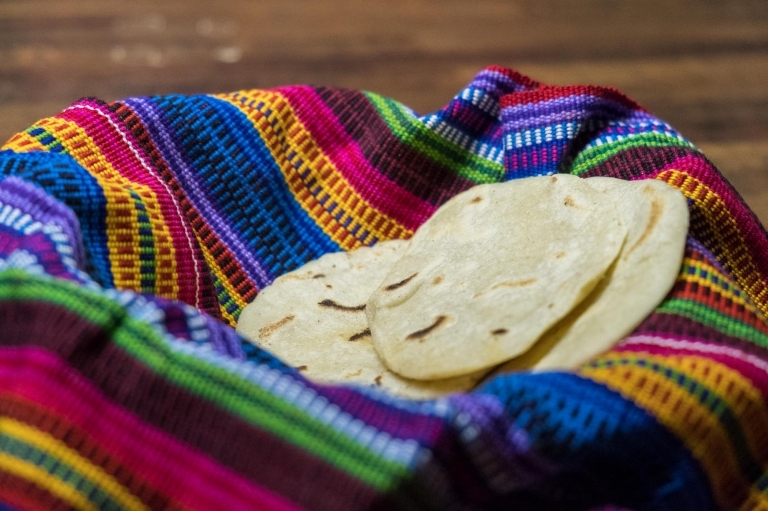 You could go and learn about coffee plantation and production, make peanut butter or go zip lining high above the shores of Lake Atitlan or if you have the courage, hike Volcan Acetenango! Add this post to your pinterest board.